DIY Herb Gardens we love! I’ve been talking about growing my own herbs for probably the last year, but with the arrival of a baby in April I STILL haven’t found the time to come up with a plan for my herb garden and actually make it happen. And now that it’s August, I’m thinking it’s probably best for me to push this project to the top of the list for next Spring. That said, being the mom of a newborn means that I’ve spent endless hours nursing these past few months and I’ve kept myself entertained by surfing the web and browsing Pinterest on my iPhone (what did women do back in the day without their smartphones!?!). I’ve pulled together a few of my favourite ideas for growing your own herbs. Not only is a herb garden functional (never again will you spend money on a large bushel of dill only to use 1 tablespoon in a salad dressing and have the rest go to waste), herb gardens are also a great way to decorate your kitchen, deck, patio or porch with some greenery. 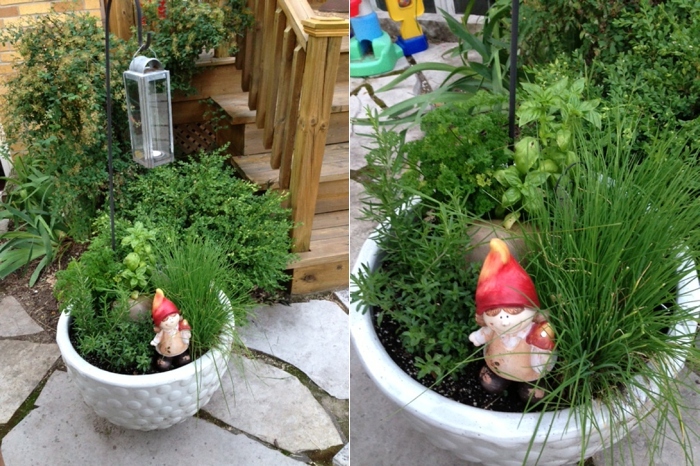 And here is Shalini’s planter of herbs. 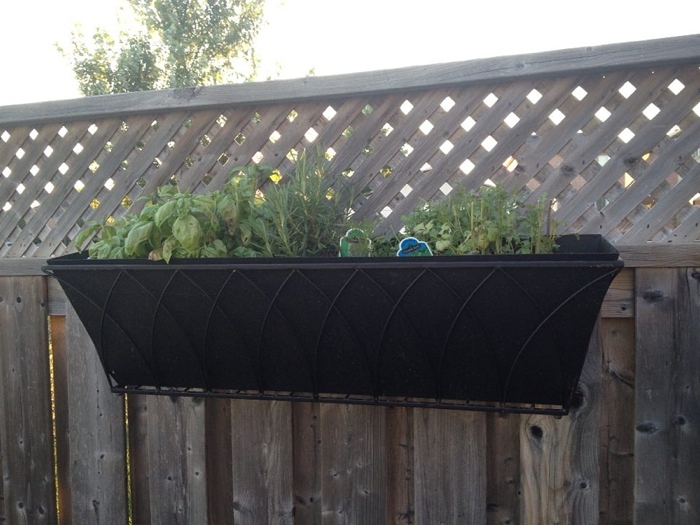 If you don’t have a ton of space, hanging a planter off your fence or a railing is a great idea. It takes a boring old fence from drab to fab. If you are not short on space and consider yourself to have a decent sized green thumb, you can do what my dad did and spruce up the otherwise “forgotten” side walls of your house with a garden. Rather than pass by a blank wall when you travel from the front driveway to the backyard, my dad has planted all of his herbs along the wall (along with some climbing Ivy). It’s a great use of space, adds to the beauty of his yard and smells quite heavenly as you pass by. And finally, here are a few DIY projects that I fell in love with on Pinterest. All three of these can be done on the cheap and would look great both indoors to decorate your kitchen, or on the back deck.